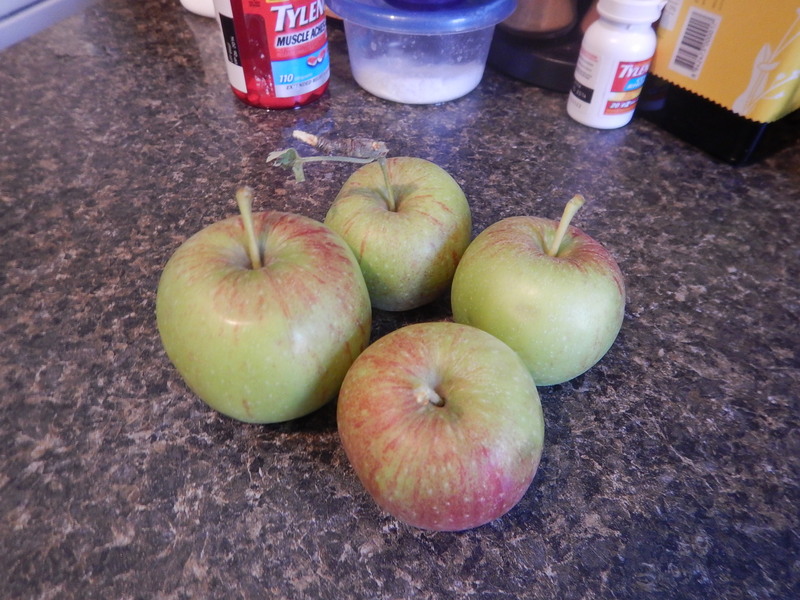 We have been so fortunate this season to have two trees FULL of apples! 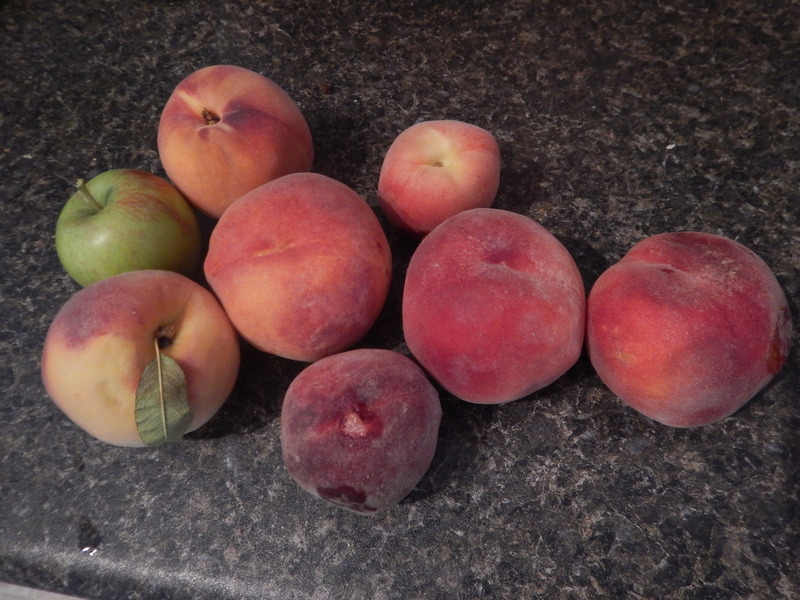 They are sweet enough to eat, and I’ve been using them as often as I can, in as many recipes I can think of! Look at those beauties – all blushing red. Great addition to our yard! 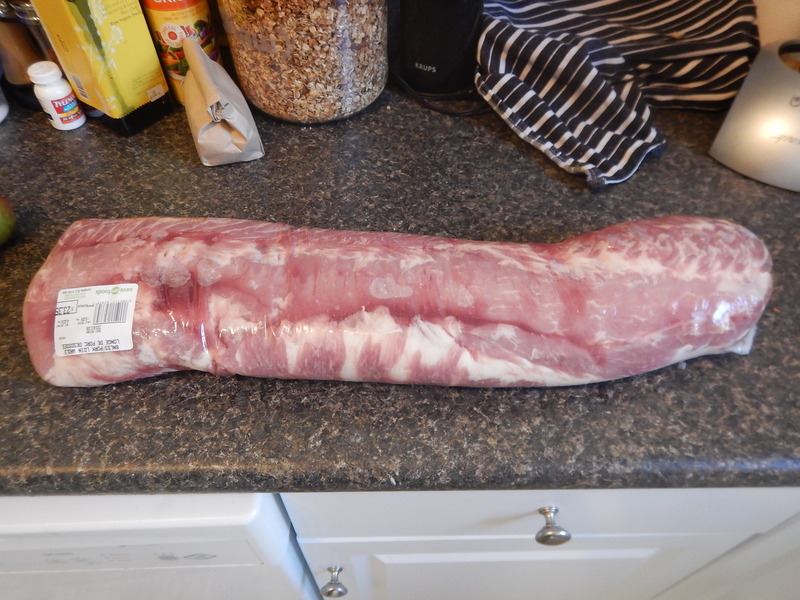 I bought this pork loin at save-on-foods. Just LOOK at how big it is! It was only $23, so I couldn’t resist! This recipe was very interesting. 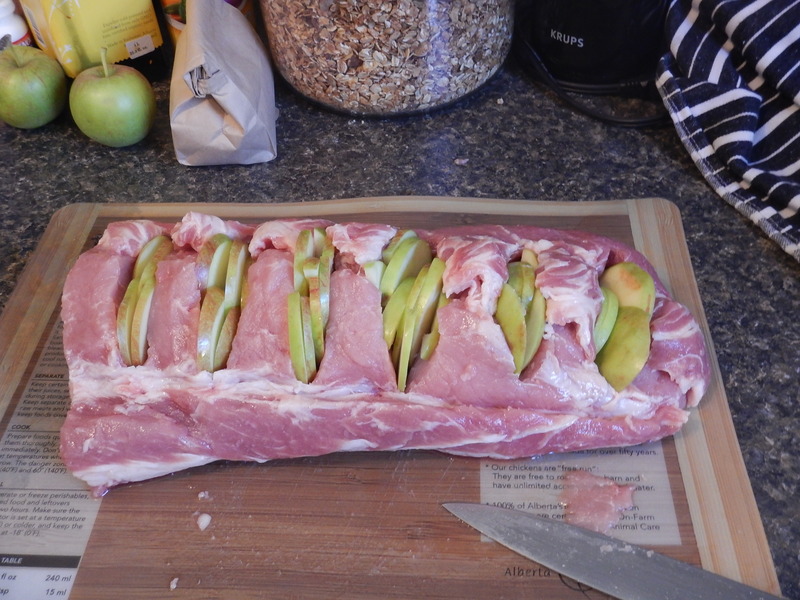 First, cut slits into your pork loin. 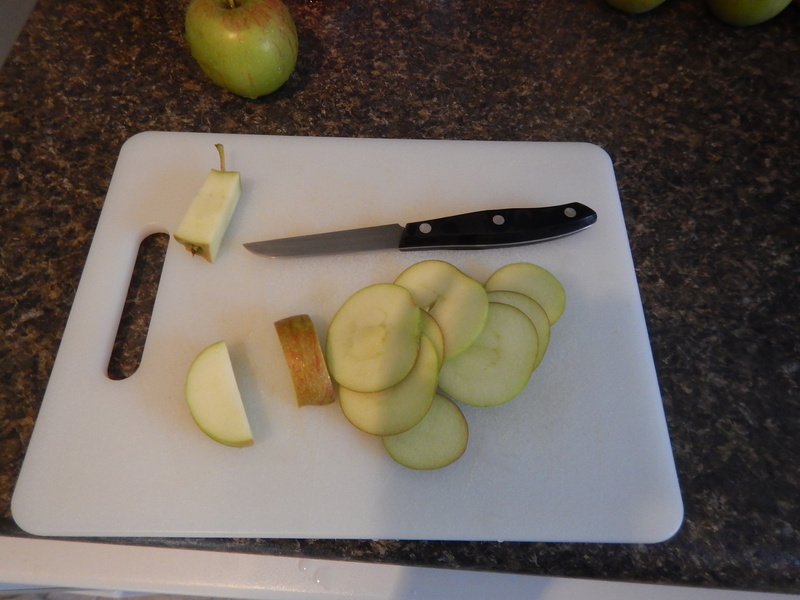 Then, slice up the apples very thin. 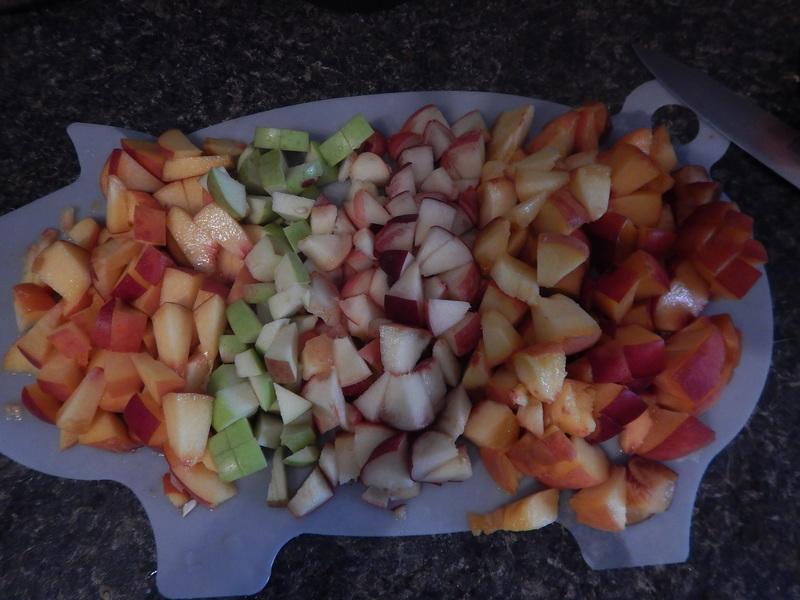 Next, fill the slits with the apples. Melt some honey until liquid and rub it all over the roast. 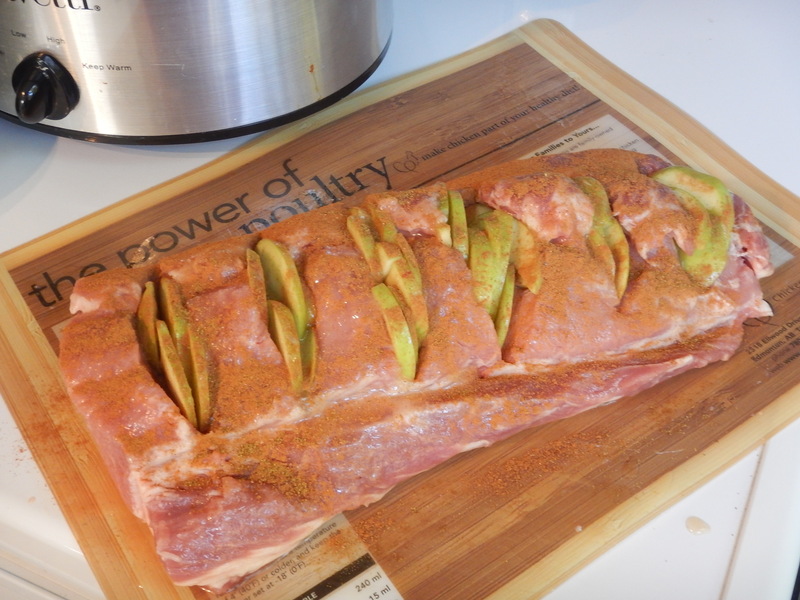 Sprinkle cinnamon and cumin all over the roast, and rub it all in. Transfer to your crock pot and cook on low for 6-8 hrs. Serve for a fancy dinner party, with minimal work! 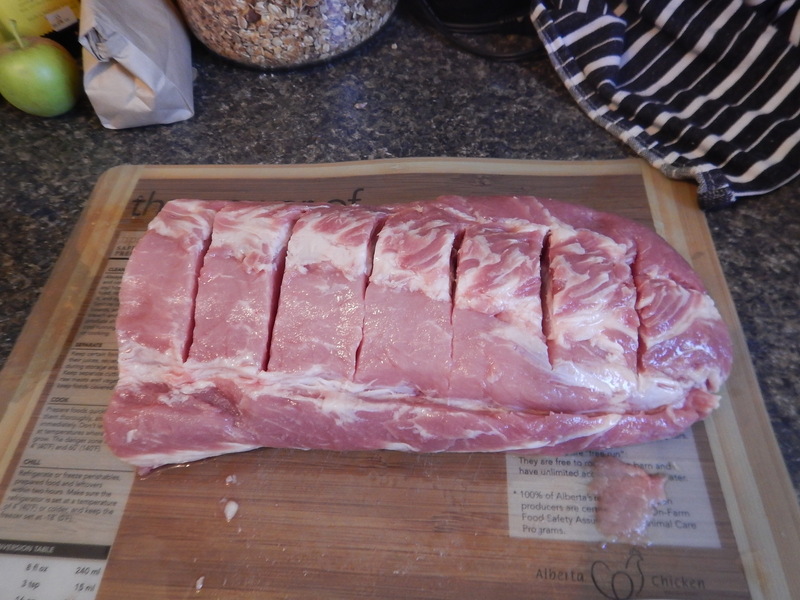 Begin by slicing deep slits into the pork loin. 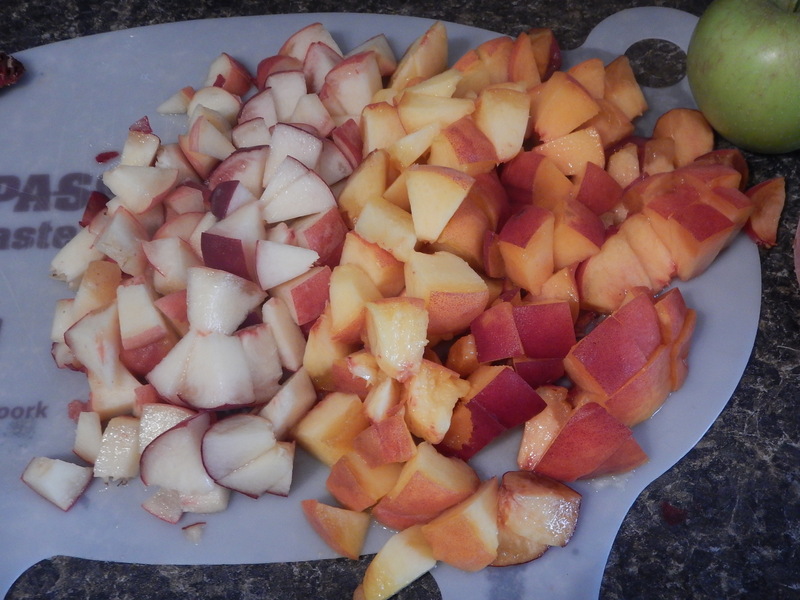 Then, slice your apples thin. 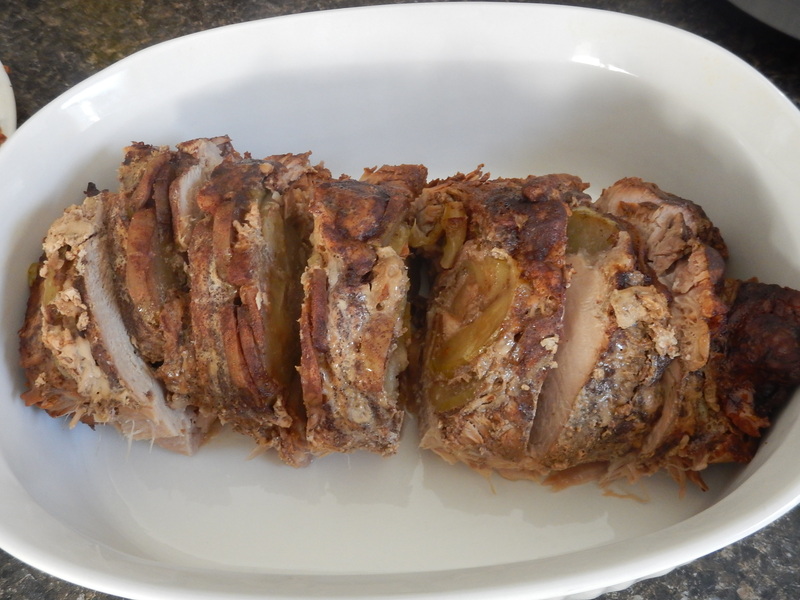 Add as many slices of apple to the roast slits as you can. Rub honey, cinnamon and cumin all over the roast. 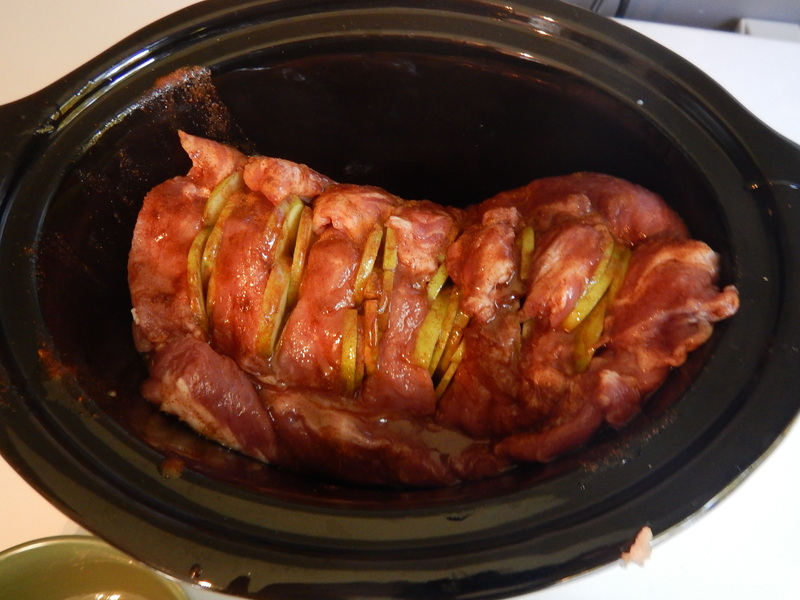 Pop it into your crockpot and cook on low for 6-8 hrs. Serve with a glass of homemade apple cider on a warm fall evening. I’ve been looking for snaky recipes that are tasty and that fill you up. This one did the trick. 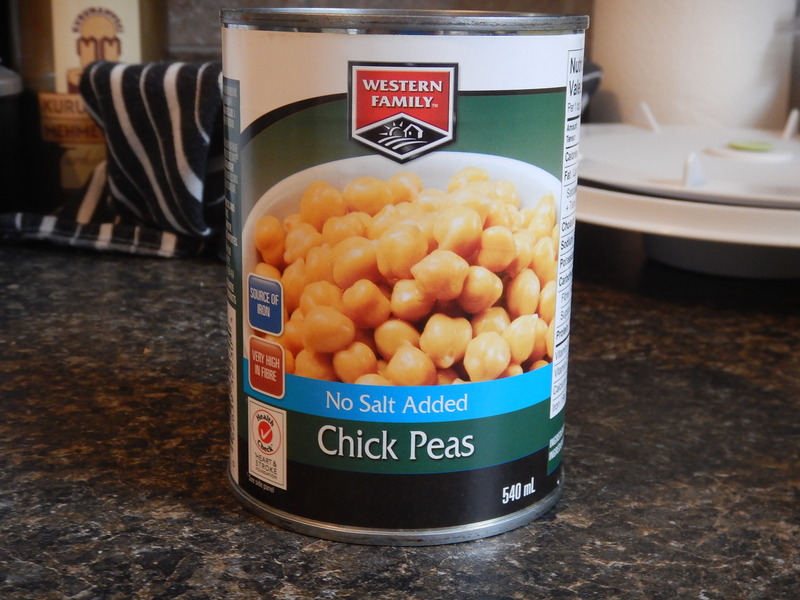 I like chickpeas! They are tasty and add a powerful protein punch to your snack. First, drain and rinse your chickpeas. 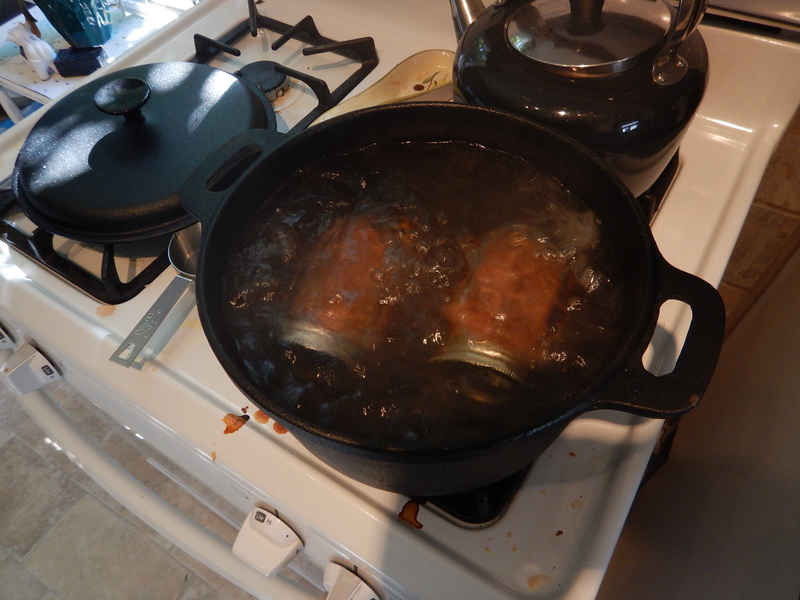 Next, lay them on a paper towel to try and get out as much moisture as possible. 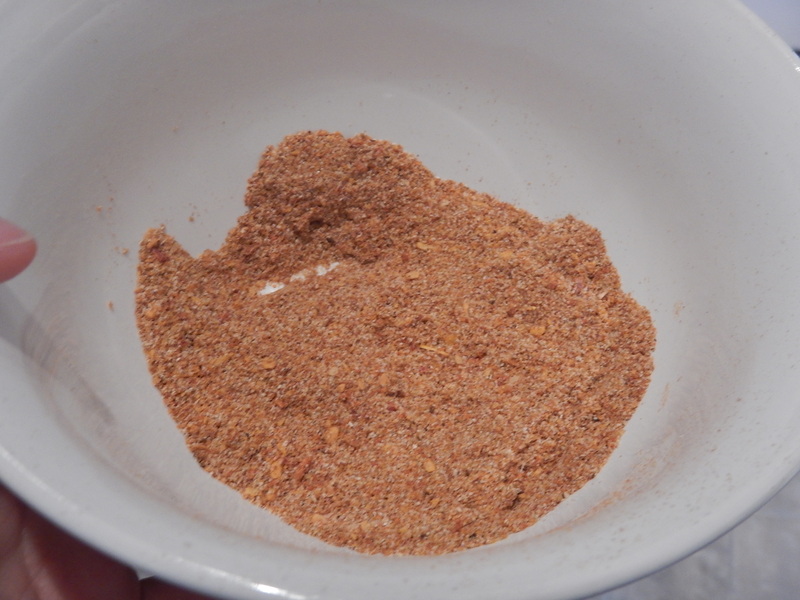 While it’s draining, heat your oven and make your spice mix. 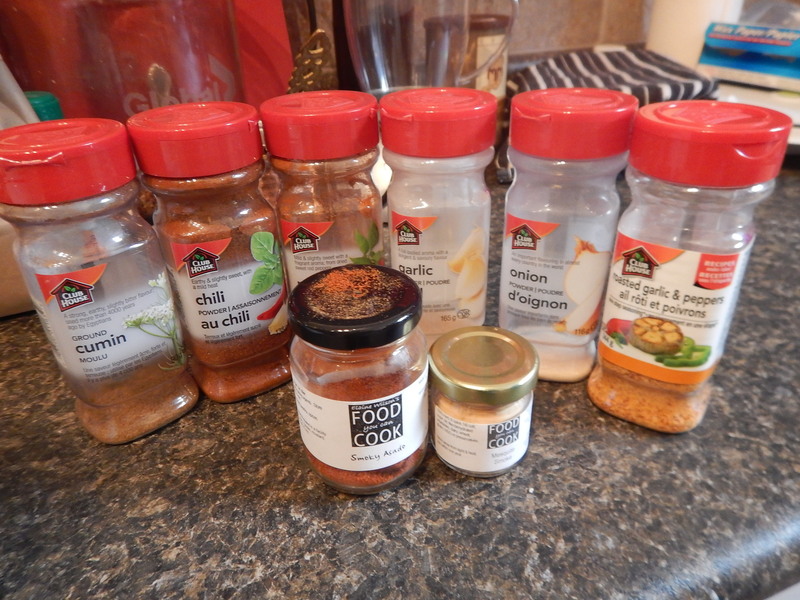 I used a lot of different spices in my cupboard. In the end, it kinda tasted like a BBQ rub. 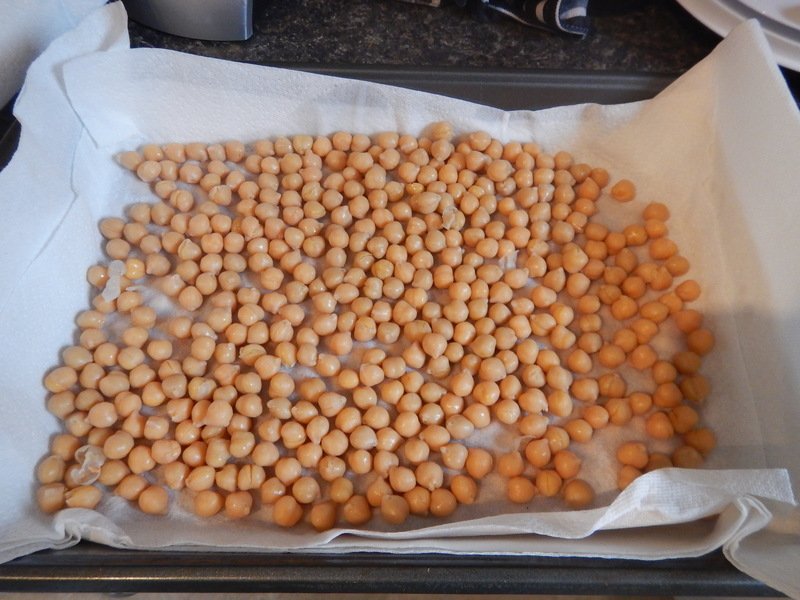 Line your baking sheet with wax paper and roast the chickpeas until they are crunchy. Toss with olive oil and coat with seasoning. 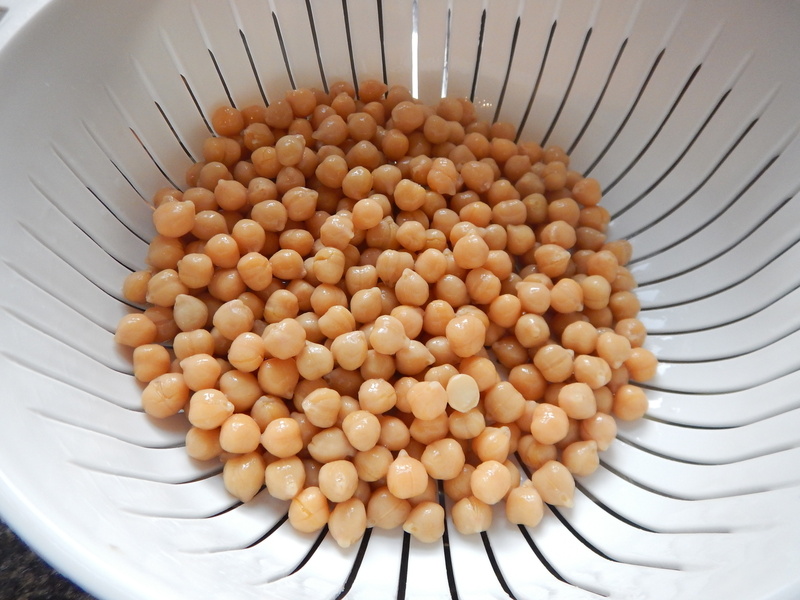 Drain and rinse your chickpeas. Heat oven to 375. 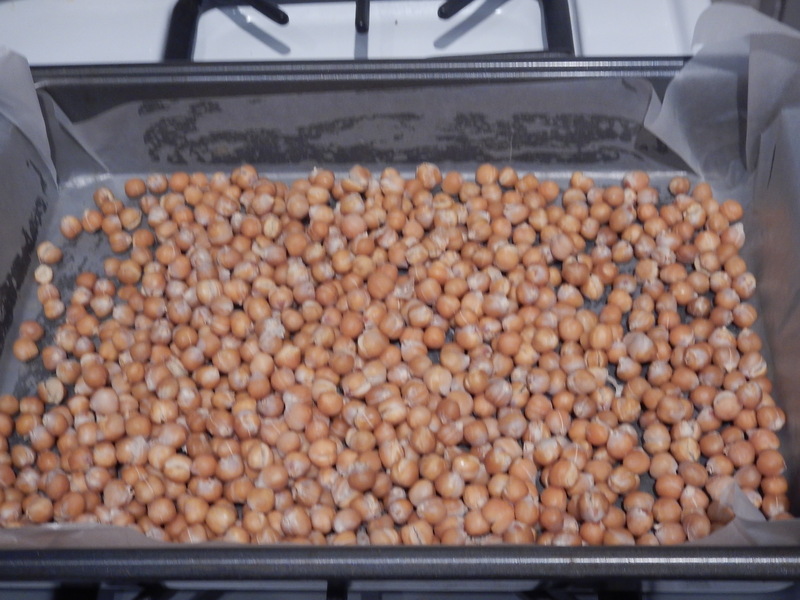 Lay chickpeas flat on a paper towel and let drain for 10 mins. Pat dry. Mix all seasoning thoroughly. 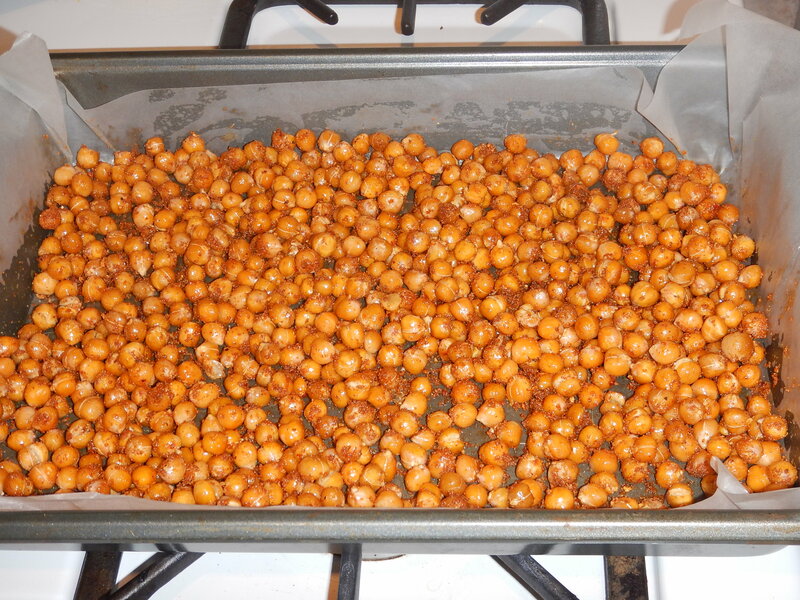 Roast chickpeas, shaking pan ever so often, until the chickpeas are crunchy. While still hot, toss with oil and seasoning mix. Make sure the chickpeas are evenly coated. Enjoy! 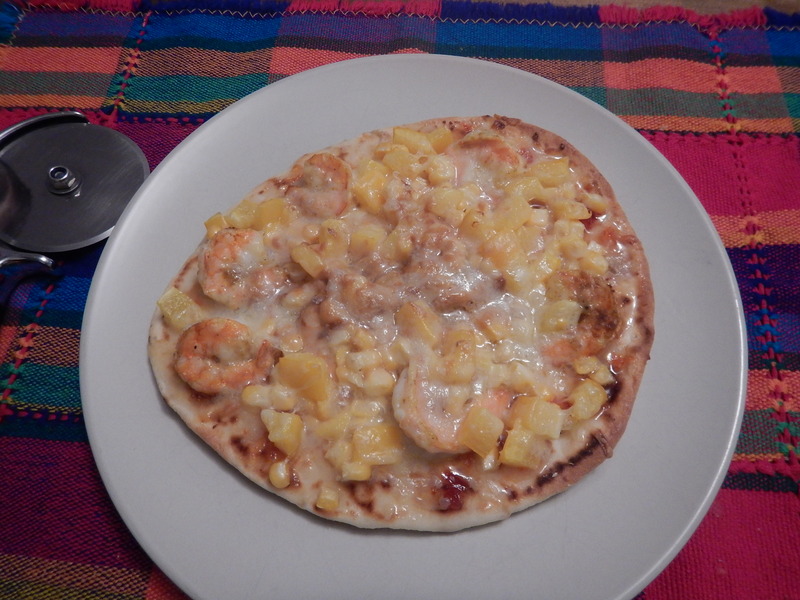 Sweet Chili Shrimp Pizza – and a Giveaway! I know, you’re intrigued! A giveaway, you say? Why yes! I’ve never done that before! Stay tuned at the end of the post for something fun and interesting! I made this awesome sweet chili pizza for dinner tonight and Justin nearly lost his mind with how much he loved it! 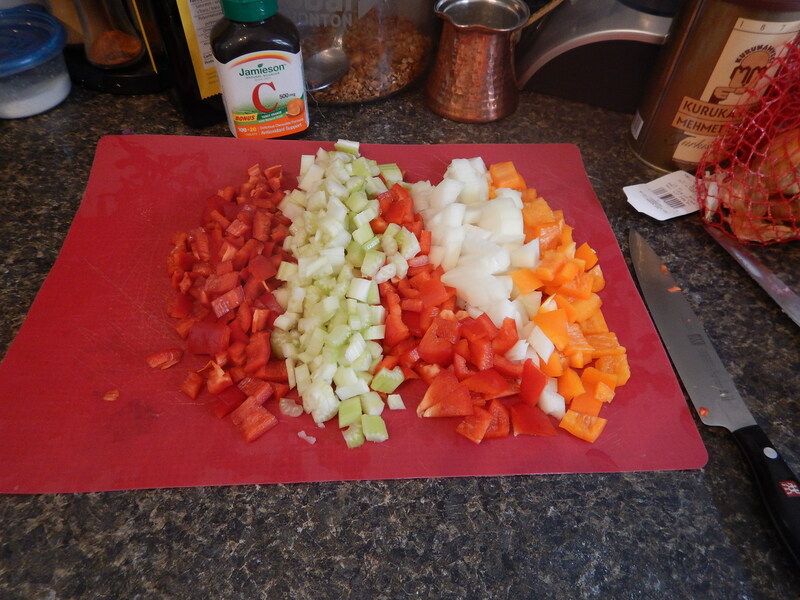 First, I chopped up some peppers. 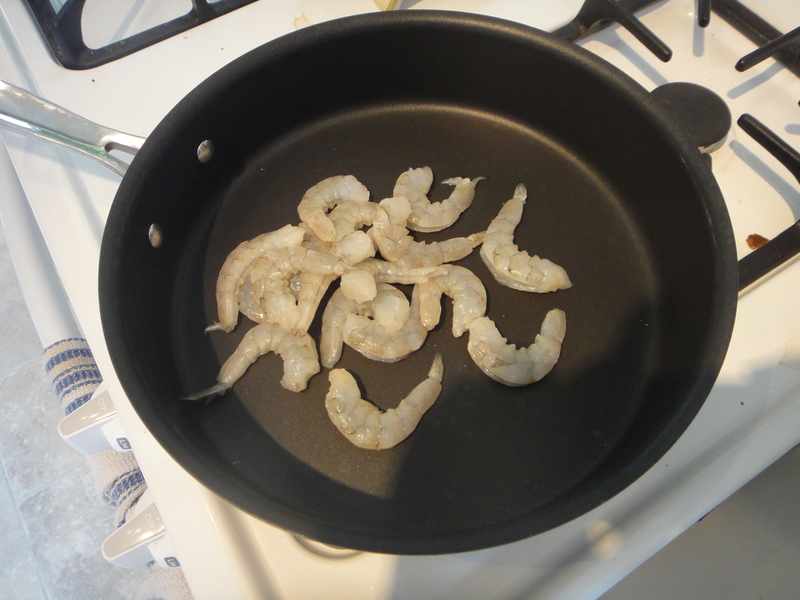 Then I thawed and peeled some shrimp. Then add your toppings. Mine included shrimp, corn, peppers, and three cheeses. Bake at 400 for 10 mins, and enjoy! 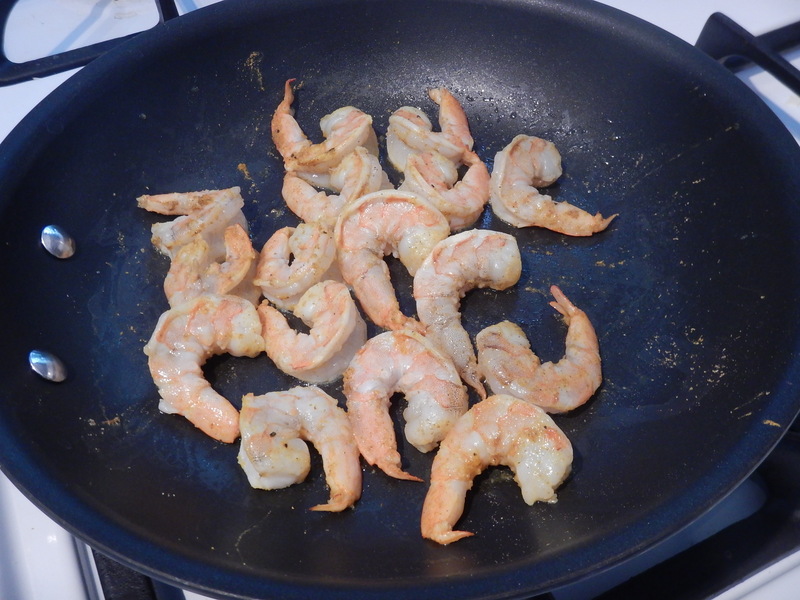 Cook your shrimp with the seasoning, turning them once, for no more than 2 minutes. 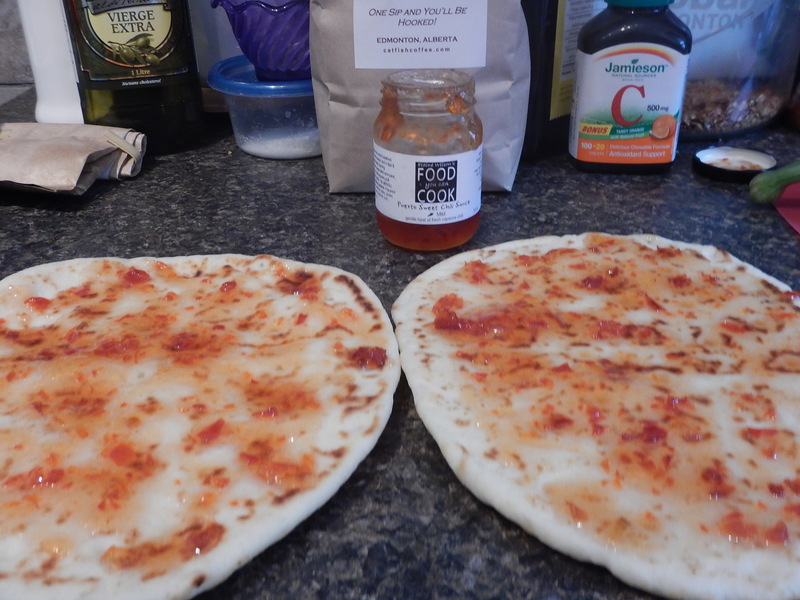 Spread the sweet chili sauce on the naan break. 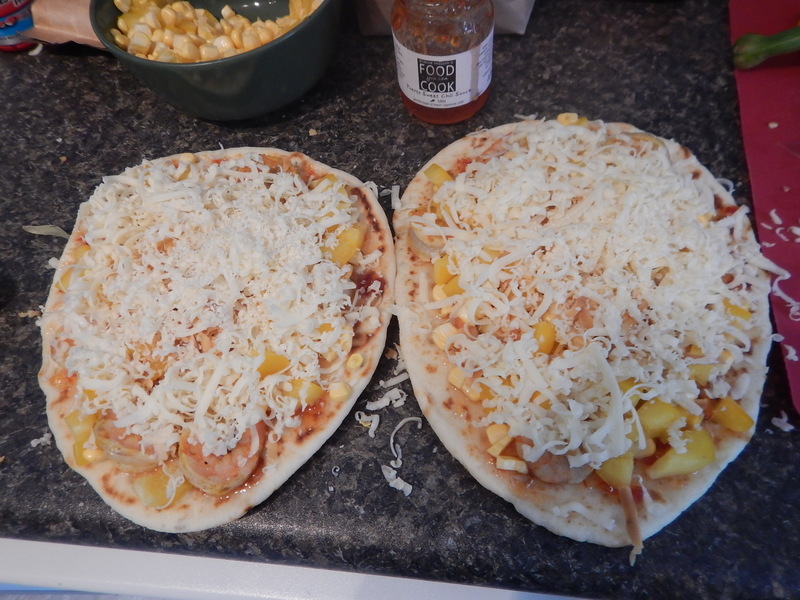 Add the shrimp, corn, peppers and cheese and bake at 400 degrees for 10 minutes. Enjoy! I’m going to the Hawker’s Market on Saturday and I have 2 tickets to give away. This time, the Hawkers Market is at Latitude 53 on Saturday at 5pm. Their goal for Edmonton is to continue to host markets regularly and help encourage the growth of new food businesses and entrepreneurs in Edmonton while continuing to increase the diversity of the markets each time they are held. This is their first Fall event of the season. Please comment on this post on what your favourite meal for fall is, and I will randomly draw someone on Friday at noon. For more info on the market, visit their event page. Thanks! I look forward to your comments! This recipe was really easy and really good! First, brown your meat in the bottom of the your pot. Dice up all your veggies and add them to the pot too. 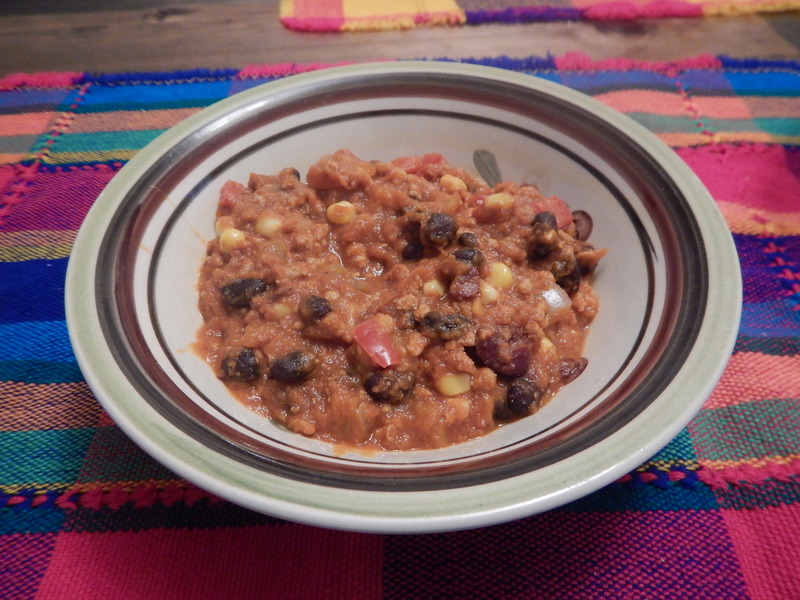 I added a cob of corn to this recipe. 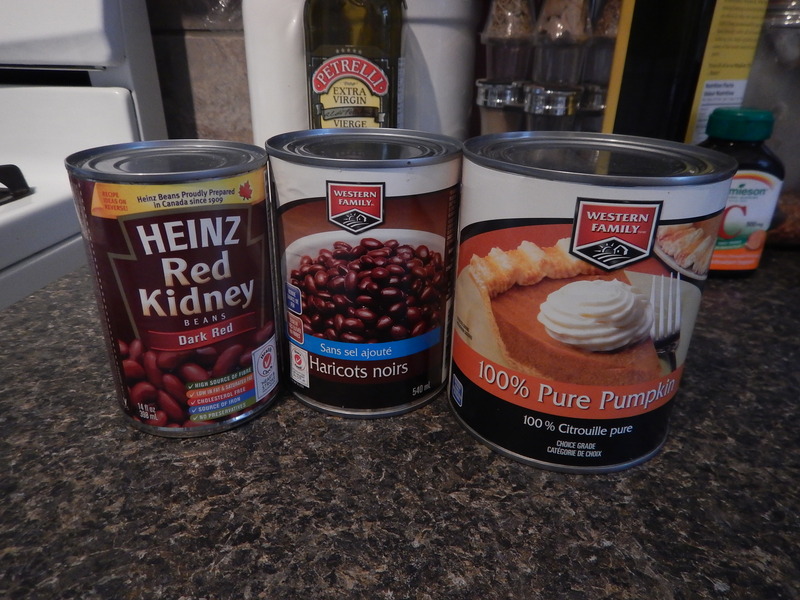 Then add the pumpkin, beans and tomato sauce. Enjoy on a cold, rainy fall day. Begin by browning the meat in a large pot with a little oil. Chop your veggies and add to the pot. Cook them down for 10-15 mins. 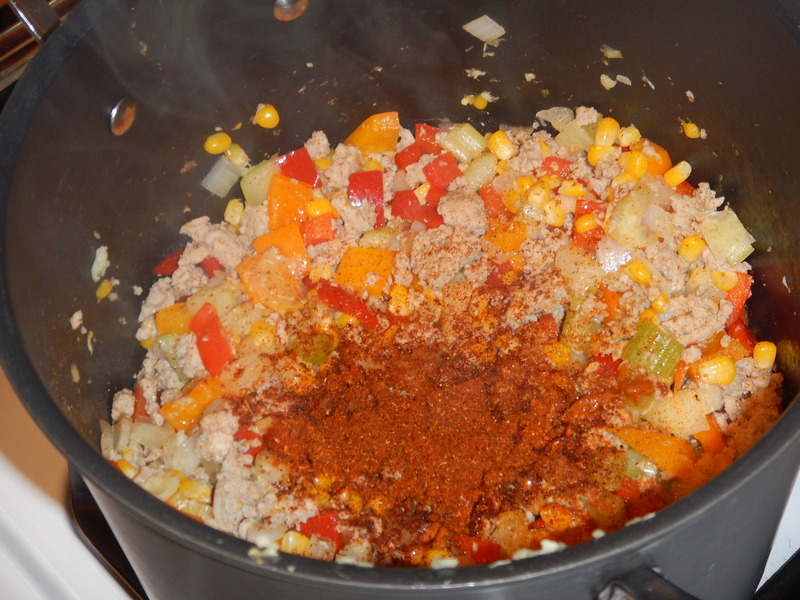 Add the spices and stir to combine. 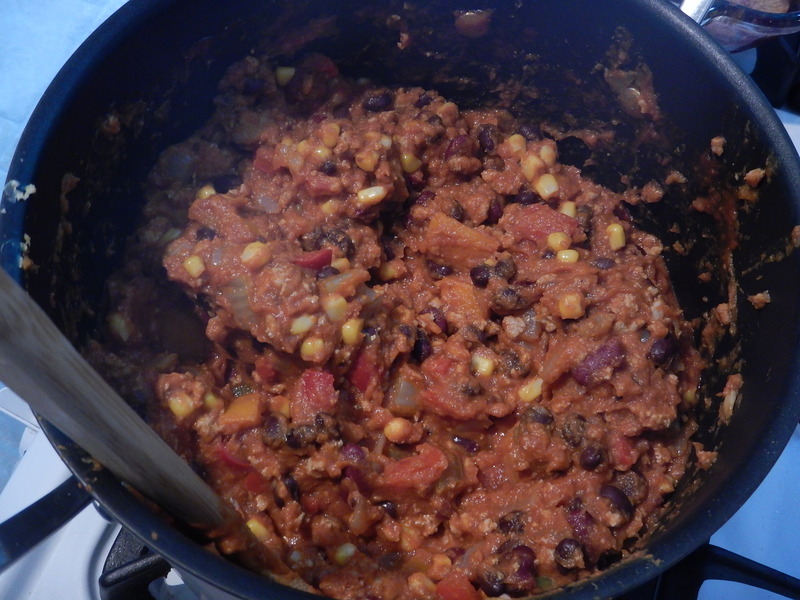 Add pumpkin, tomato sauce and the beans, then bring to a simmer. Let simmer for 20 mins. Serve with sour cream and cheddar cheese! Hi everybody! It’s been a while. Sorry! 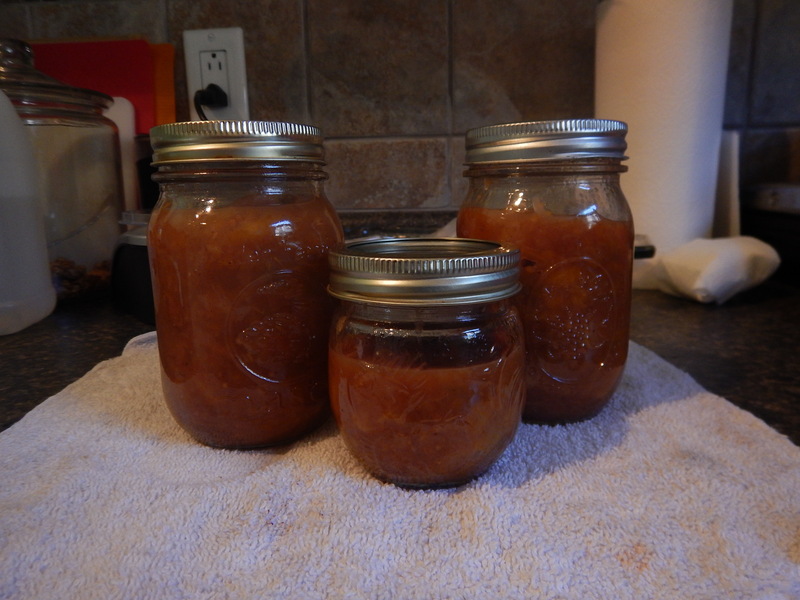 Ive been busy making recipes, like this peach chutney. Yummerz! Dice up half an onion, and cook it down a little bit. Here they all are, in their different hues. Bring all the ingredients to a boil, and let simmer and bubble for an hour. Fill with chutney and boil again. Let them cool, and you’ll hear a little “pop” as they seal themselves. 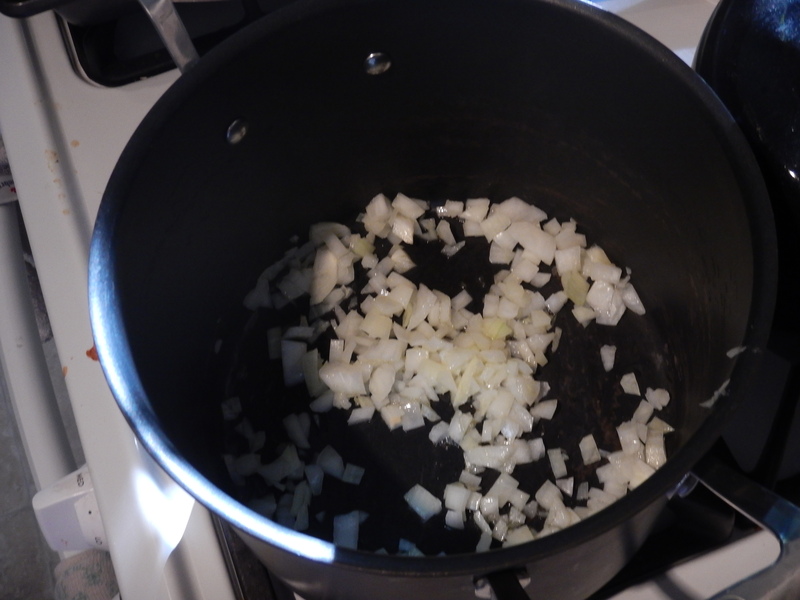 Chop onion and brown in a pot with a little bit of oil. 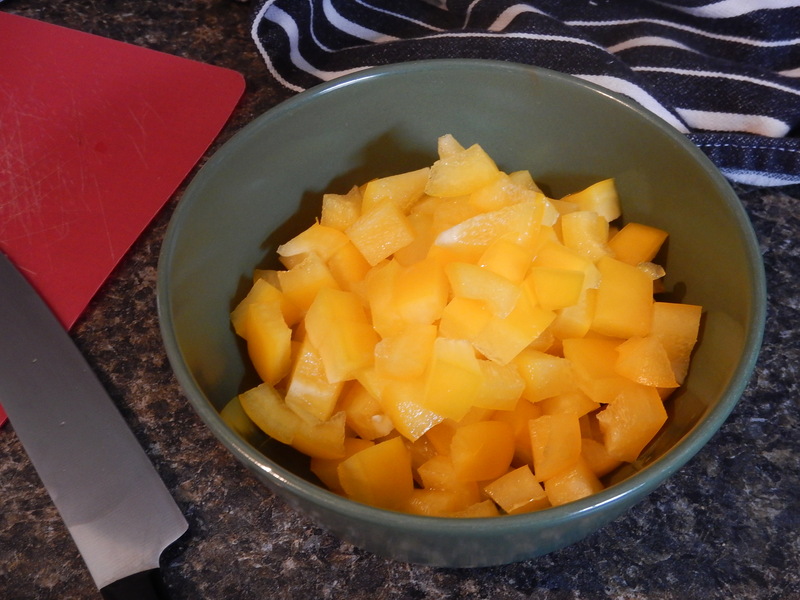 While browning, chop up your peaches. Add them to the pot. Add juice, vinegar, honey, ginger and spices. 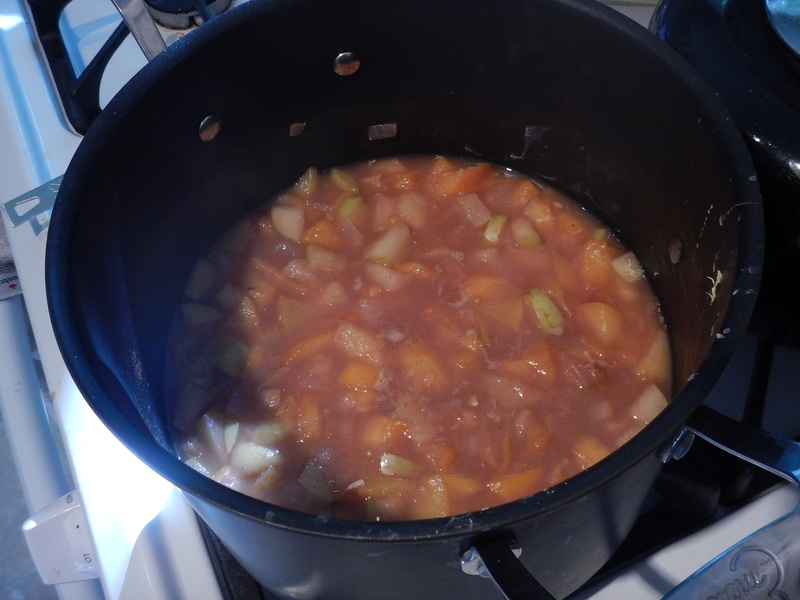 Bring to a boil then let simmer for an hour. Boil your cans, and let cool slightly. 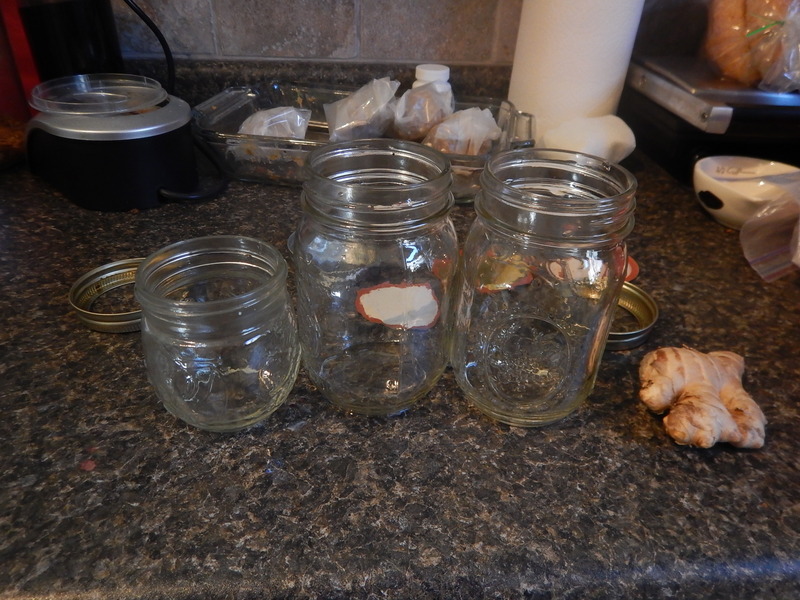 Fill the cans, seal them, and then transfer back to pot of boiling water. boil for 10-15 minutes. Let the cans cool, and you will hear a little “pop” as they seal themselves. Enjoy! Recently, my cousin gave me a whole bunch of dill from her garden. I’ve been incorporating it into as many recipes as I can, trying to make the most out of it’s awesome fresh taste. I love the aroma that dill leaves after you’ve chopped it up. It smells like summer and perogies! 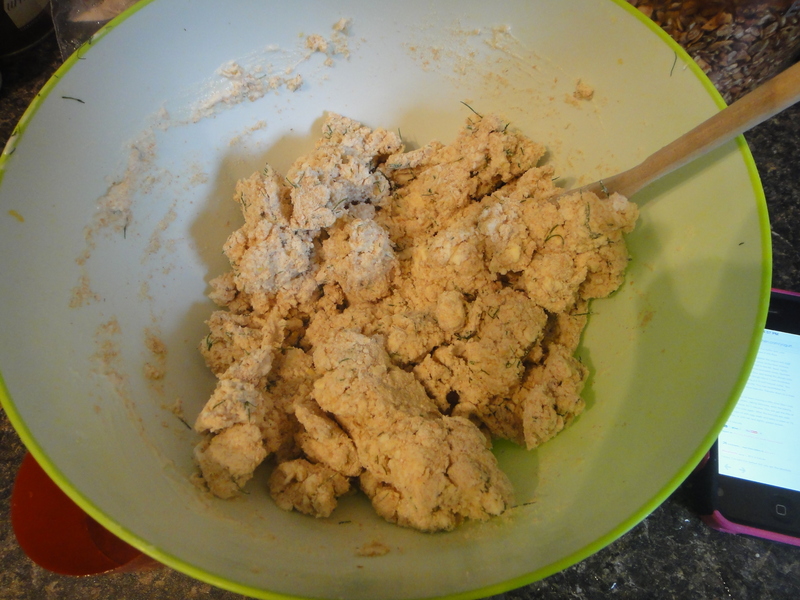 This recipe was fairly simple, and called for the best of scone ingredients: flour and butter. I added some lemon zest, to brighten them up a bit. And then I mixed it all together. 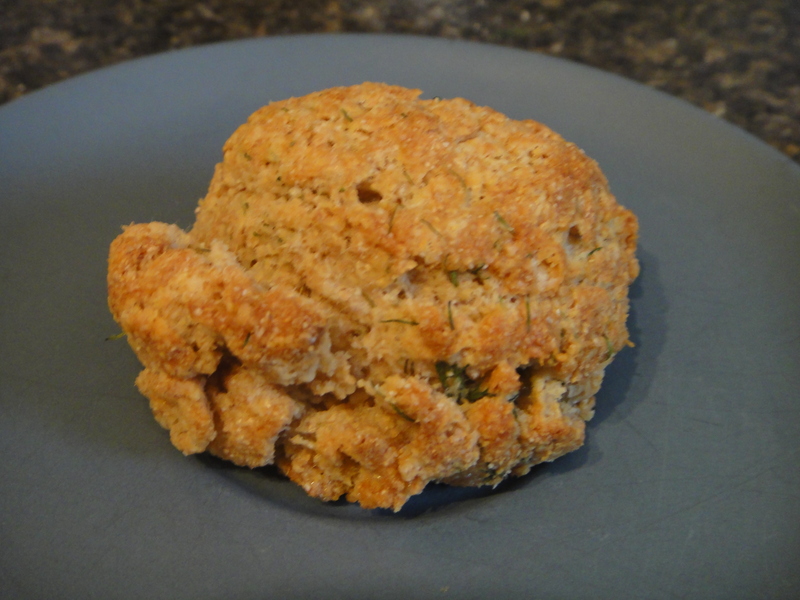 Great scone recipe! I think I shall use this one more often! Preheat oven to 400F. 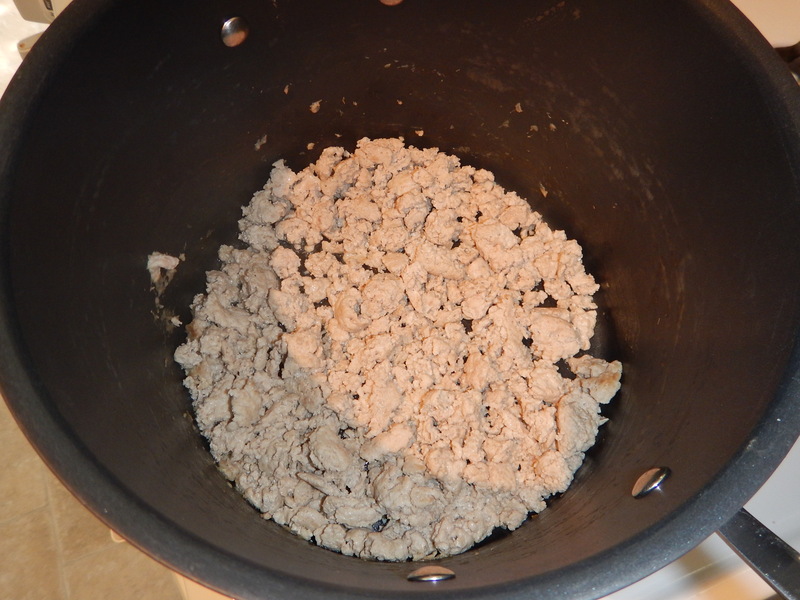 In a large bowl, mix together the flour, baking powder, and baking soda. Add the cubed butter and transfer to the freezer for 10 minutes. 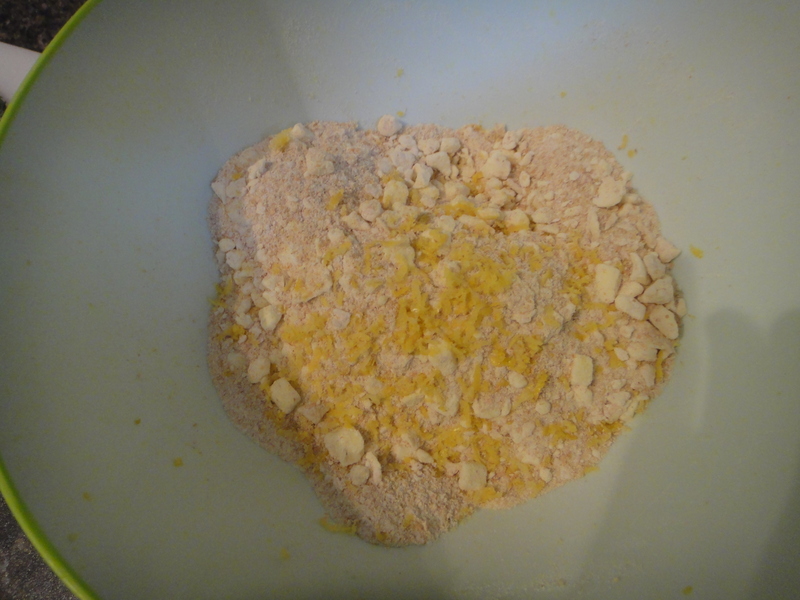 When it’s done chilling, break up the butter with your hands until it resembles small peas in the flour. 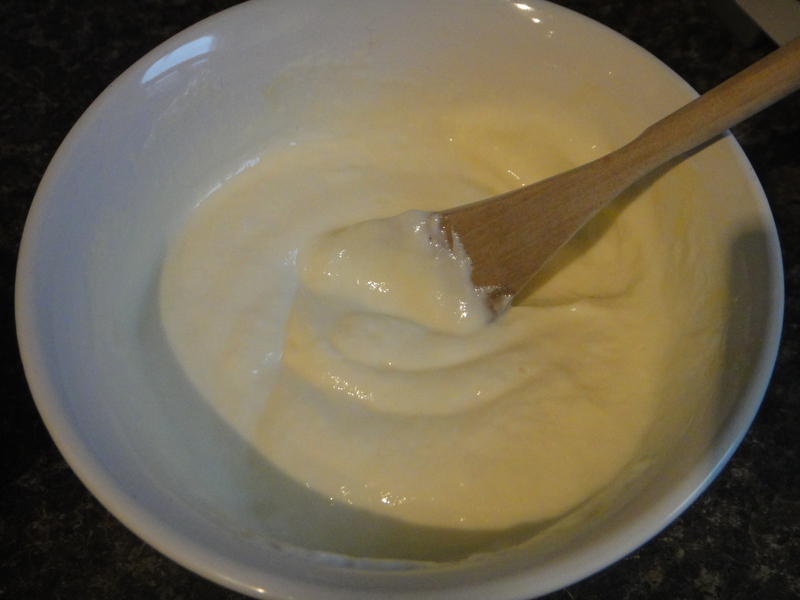 In a medium bowl, whisk together the yogurt and egg. 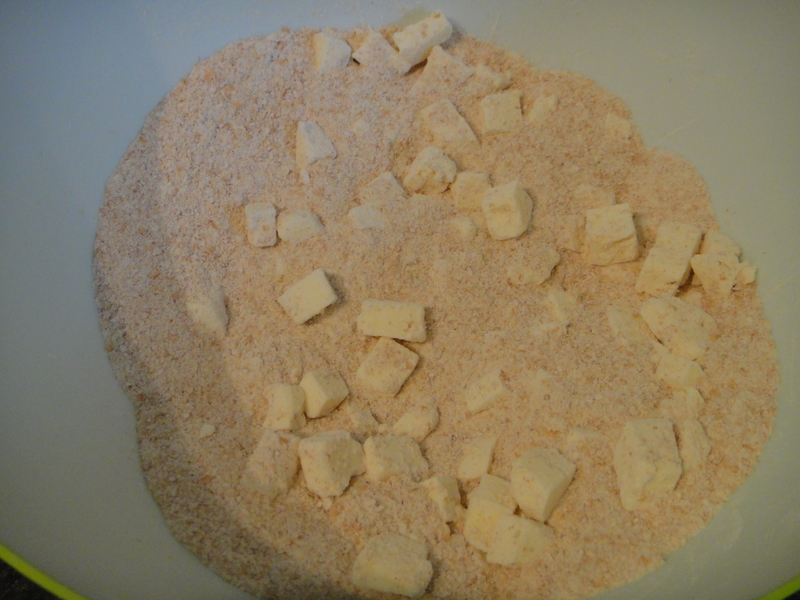 Add the yogurt mixture, all at once, to the flour mixture. Mix until barely combined. Fold in the dill and lemon zest. 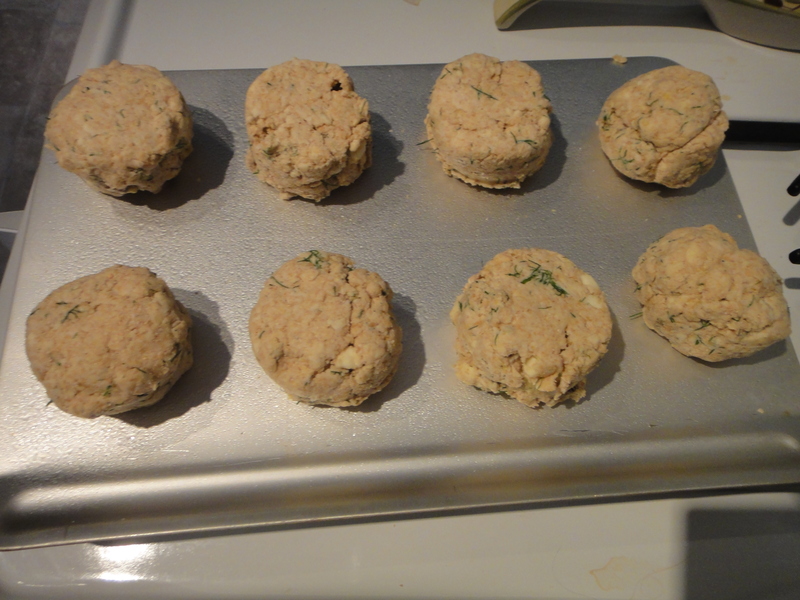 Cut into scone shapes, or loose balls of dough. Spray a baking sheet, and add the scones. Bake for 15-20 mins, until golden brown. Enjoy warm, for breakfast! I found this recipe on pinterest the other day, and it just sounded so good that I had to give it a try! 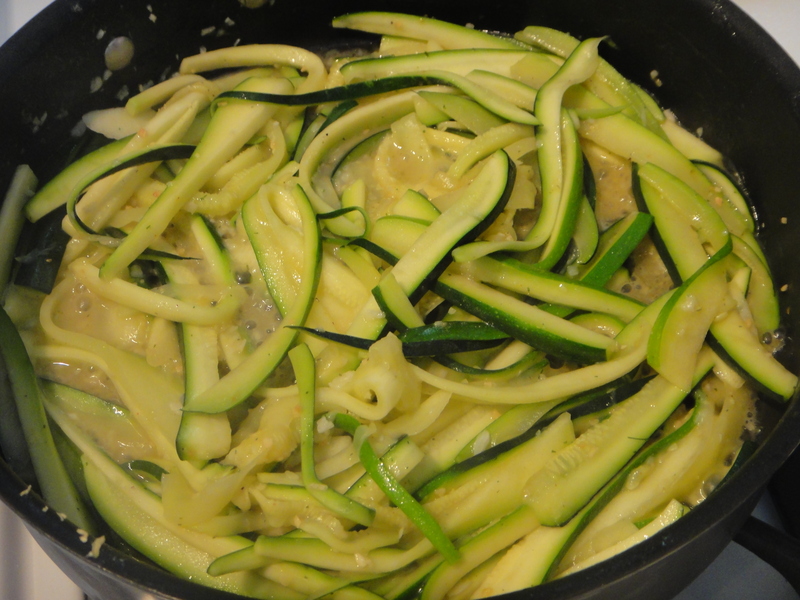 First things first is to make the zoodles – Zucchini noodles – by using a mandolin. 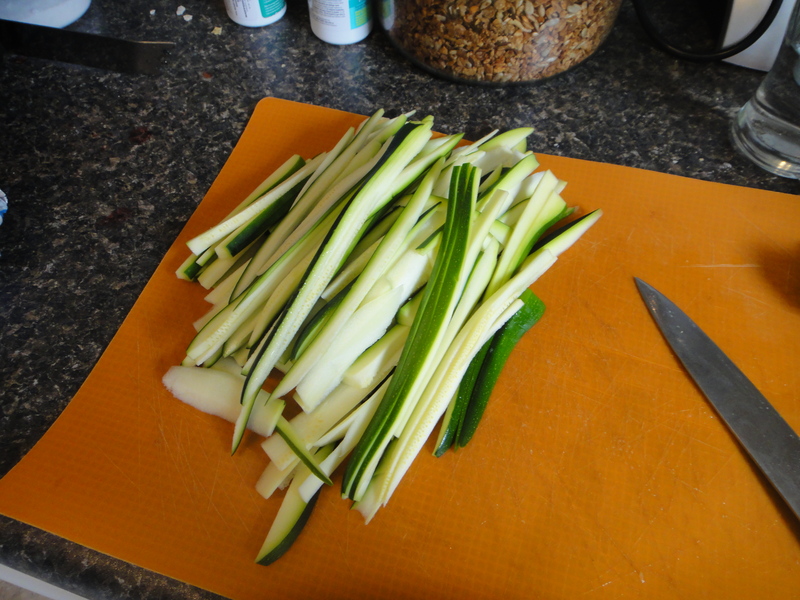 I don’t have a mandolin, so I used a knife to cut the zucchini into very thin pieces. 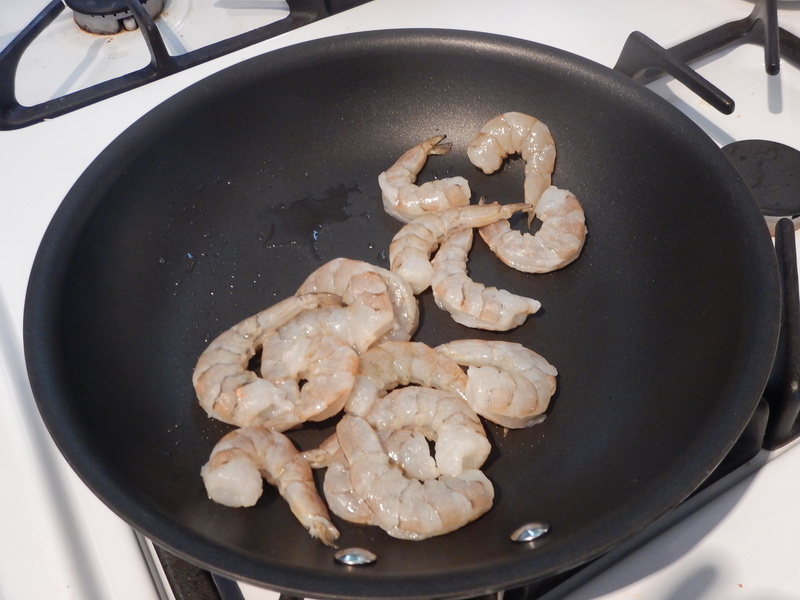 Next, peel and shell some shrimp. 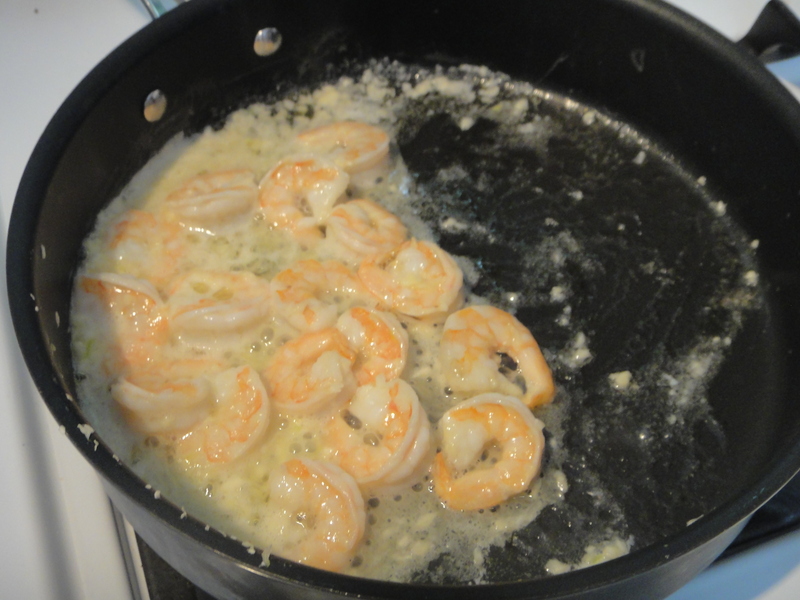 I melted some butter and minced some garlic to cook with the shrimp. 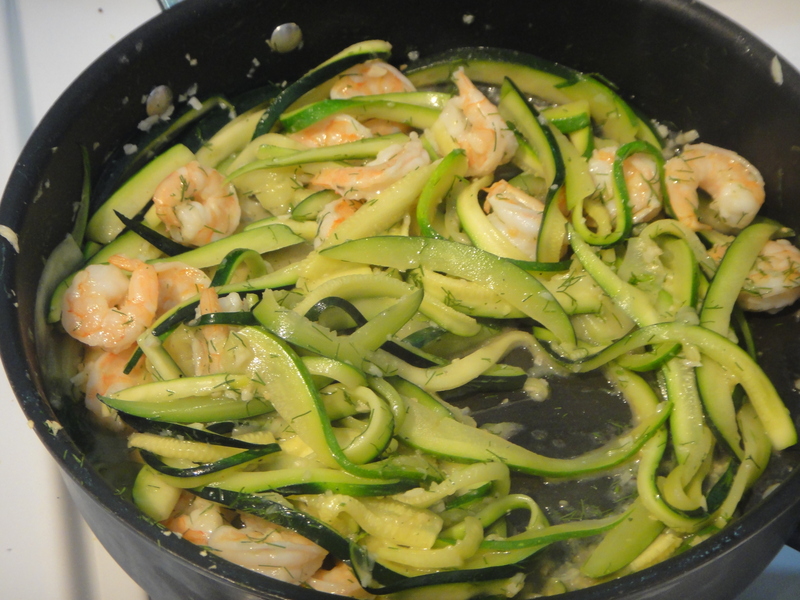 In goes the zoodles – cook them until crispy but tender. Don’t overcook it, or you’ll have leathery shrimp, and no one wants that! Plate, and top with some dill. Yum! 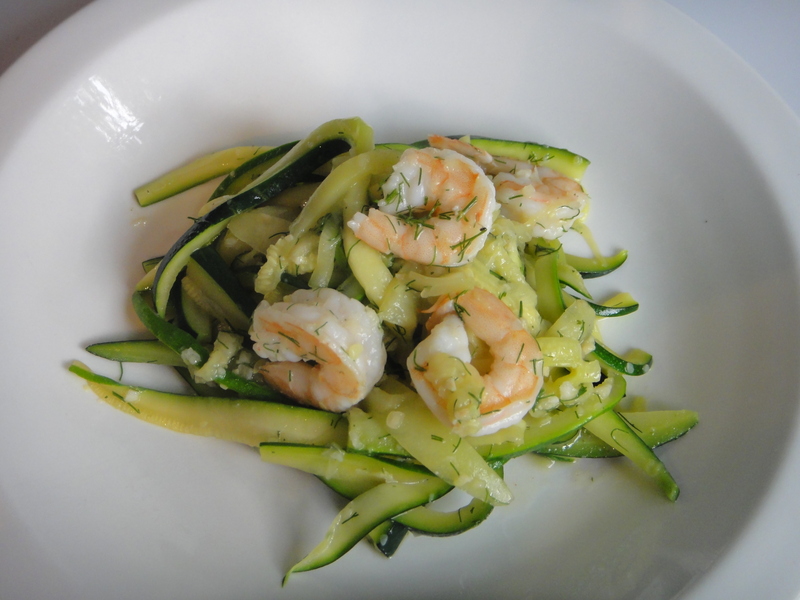 Using a mandolin, cut your zucchini into “zoodles.” Peel shrimp and place in pan. Melt butter and mince garlic. Cook until shrimp just turns pink. Add zoodles. Cook until tender, but still a little crispy. Chop dill and serve on top of dish. Enjoy!